"It's man jewelry. If you're going to wear a nice watch, you should wear a nice belt," says Rusty Estes, former college golfer and now the head of business development for Atlanta-based belt maker House of Fleming. For more than a decade, Estes has slapped leather onto some of golf's biggest stars, including Phil Mickelson, Ian Poulter and Jason Dufner. He's the guy who can tighten up your Tour look. 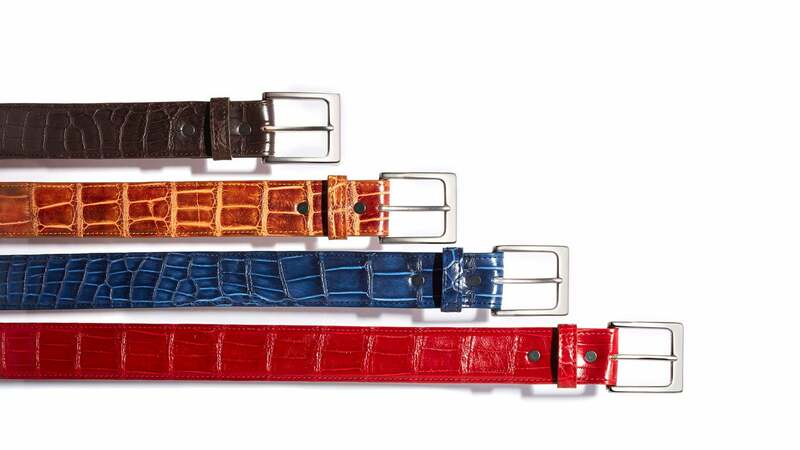 IT STARTS WITH NAILING YOUR BELT WIDTH… "You need an inch-and-a-half American alligator belt. That'll fit 90 percent of our golfers," Estes says. "Everyone above 5' 7" and under 6' 7". Outside those extremes, bump it up or down." …THEN COVERING YOUR COLOR BASICS… "Medium brown, dark brown and black. To take it next-level, go dark gray and dark blue. From there, the sky's the limit. Yellow, sky blue, red—that's when you really make a statement, like Justin Thomas wearing a pink belt while shooting a 63 at the U.S. Open. How cool was that?" …AND THEN KEEPING ON TREND… "Every year certain themes take over. Lately it's what we call "California casual"—grays, off-whites." …WHICH NO LONGER INCLUDES WHITE. "White belt? Its best days are behind it." BUT, OF COURSE, SIZE MATTERS… "When all else fails, get the right fit. You should always wear your belt in the third hole. No exceptions!" …WITH THE BUCKLE, TOO… "A few years ago, there was a trend with big buckles. They're more subdued now." …AND WHO'S BIGGER THAN DJ? "If you want to look like Dustin Johnson, give us a call—we make his belts!" House of Fleming belts range in price from $300 to $650, depending on size (width and length) and type of buckle. Available at houseoffleming.com.